"In Western Japan, a bottle of champagne is smashed against the hull of a massive bulk cargo vessel, its path charted along the arch of the northern hemisphere: We follow its gentle glide through the lilac calm of the Japanese outer islands; a waive at the lights of Busan, the South Korean city along its charted path; the frigidity of the Aleutian Islands; a circular motion to avoid a mid-ocean monster; and lastly a cruise into Portland past the forests and factories on the Columbia River. On this maiden voyage across the Pacific, the vessel’s holds sit empty. One is in ballast to strengthen against heavy storms. A crew of twenty, plus four creative wanderers—including artist Cole Sternberg, who wrangled the quartet especially for this journey—anxiously steady themselves for weeks under swaying ground. It is within the context of this floating island that the work comprised of “The Nature of Breathing in Salt” emerges. We find rainbows confronted by fluorescent hallways, black clouds fighting the setting sun, Sternberg’s paintings dragged in the sea, the glory of the unknown and unwelcoming greeting of the land. The imagery shifts in a bell curve of pleasant anxiety, mirrored by a narrative of Melville, Sternberg’s poetry and the dialogue of the crew. It is an experience that leaves one yearning for and sick of the sea. It is an art object more than just a book. Sternberg’s practice of using the environment to tell its own story is apparent here. His practice ultimately results in the paintings and photography featured throughout this book. Works from this body of imagery have been exhibited extensively, and are in the permanent collections of the Los Angeles County Museum of Art and the Pérez Art Museum Miami, and the El Segundo Museum of Art, among others". "Cole Sternberg was born in Richmond, Virginia. He lives and works in Los Angeles and practices in a range of formats, including painting, installation, video, and writing. Series of his work have focused on a variety of social issues, from current human rights activism and its relationship to the law, to the environment, to the media, and concepts of content overload. The works tend to be subtle or subversive in nature, driven by elegant visual concepts and poetry. Sternberg has exhibited nationally and internationally, including in exhibitions at the American University Museum (Washington, DC), El Segundo Museum of Art (El Segundo, CA), Los Angeles Nomadic Division (LAND, Los Angeles), Paris Photo (Los Angeles), Zona Maco (Mexico City), LA><ART (Los Angeles), MAMA (Los Angeles & Berlin) and Praz Delavallade (Los Angeles). His works are held by major collections throughout the world, such as the Los Angeles County Museum of Art (LACMA), the Pérez Art Museum Miami (PAMM), the El Segundo Museum of Art (ESMoA), the American University Museum (AUM), Cedars-Sinai, and Deutsche Telekom". 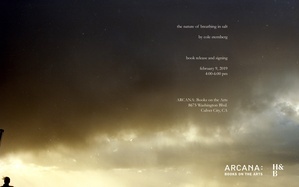 So come join us along with our pals from esteemed local publishing concern Hat & Beard on Saturday, February 9th between 4:00 and 6:00 PM to celebrate the launch of Cole Sternberg's striking The Nature Of Breathing In Salt. If you are unable to attend but would like to purchase a signed or deluxe "Collector's Edition" copy, please do so via our website here, or by phone at 310-458-1499.